In this file photo Hillsboro’s Riley Moberly takes her position at shortstop during a summer league game at Shaffer Park in Hillsboro. 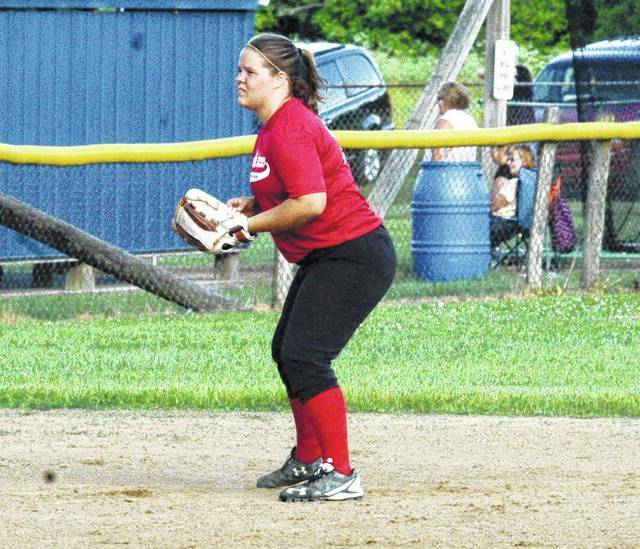 The Hillsboro Lady Indians softball team is looking ahead to the 2018 season with a sense of optimism despite a less than stellar season a year ago. Riley Moberly is the lone senior on the team and one of only four upperclassmen that the Lady Indians have at their disposal for the 2018 softball season. Hillsboro Lady Indians head coach Catherine Moberly is expecting contributions from all levels of her team including freshmen and sophomores. “Riley is a three year starter and I expect her to be the leader of a young team. Jordan Williamson is a junior that is slated to be our lead off hitter and I expect her to keep everything running smoothly on the outfield. Ashley Lykins plays second base for us and will be the leader of our infield defense. Jordan Moberly is our catcher and I expect her to control things behind the plate. Jordan will be responsible for getting Christine Page and our other pitchers on the same page. Kelcie Thornburgh and Mallory Parsons will both be looked upon to contribute in their freshman season,” said Moberly. Moberly believes that her team will give her everything they have when they step onto the field to compete. ”I expect the girls to give everything they have each time they take the field. We have a great group of girls that are competing for spots and will continue to push each other all season,” Moberly said. The Lady Indians head coach knows the grind that her team will have to battle through to be competitive this season. ”As shown in the past, the teams in our league are always competitive and I expect nothing different this year. Every game is going to be a battle, we just have to commit to that fight 5 to 6 times a week,” the Lady Indians coach said. Moberly finished by talking about her belief in the team that she has this season and how they can find success as a group. ”I believe in our team, but success will come when the players believe in their team,” Said Moberly. https://www.timesgazette.com/wp-content/uploads/sites/33/2018/03/web1_Riley-Moberley-Shortstop.jpgIn this file photo Hillsboro’s Riley Moberly takes her position at shortstop during a summer league game at Shaffer Park in Hillsboro.